ITAC is dedicated to helping NYC manufacturing and technology companies grow their top and bottom lines. ITAC do not simply advise, they also provide training and implementation expertise on a variety of topics that make companies more competitive. Working with small and mid-size manufacturers throughout the five boroughs, helping them expand into new markets, create innovative products, develop their customer base, find new partners, improve their processes and develop sustainable practices. This also translates into job creation/retention, and significant economies of time and money. 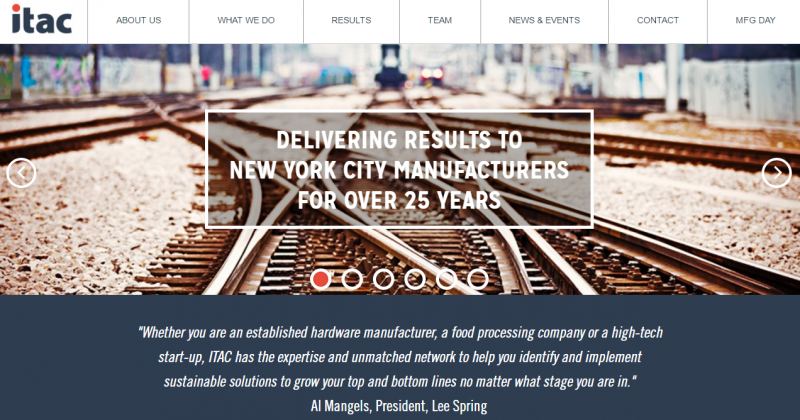 As the NYC chapter to the Manufacturing Extension Partnership nationwide network, ITAC is part of the largest consulting network in the U.S. serving manufacturing and technology companies with fewer than 500 employees, and have access to an unparalleled knowledge base. With a 25+ year record of helping companies succeed, thier team also has a deep understanding of opportunities and challenges that are unique to New York City.